Terracotta pots are a staple in The Home Depot garden department they are stacked in piles and displayed for sale throughout the year, they are simply my favorite pot. “Terracotta” is an Italian term for baked earth, clay earthenware has been in existence for a far back as records have been kept, and I have read that shards of clay were found among the bone remains of the Woolly Mammoth, clay vessels are the first utilitarian fabricated objects. Terracotta pots are the classic planter, the silhouette of a rimmed clay pot is a timeless design, and the pots fit with any décor inside or out. The Home Depot sells (literally) tons of clay pots. 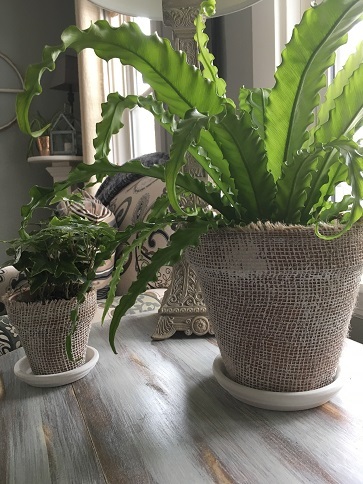 I love terracotta pots old or new, fresh from the store or encrusted in moss and from my experience; all plants thrive in terracotta pots. 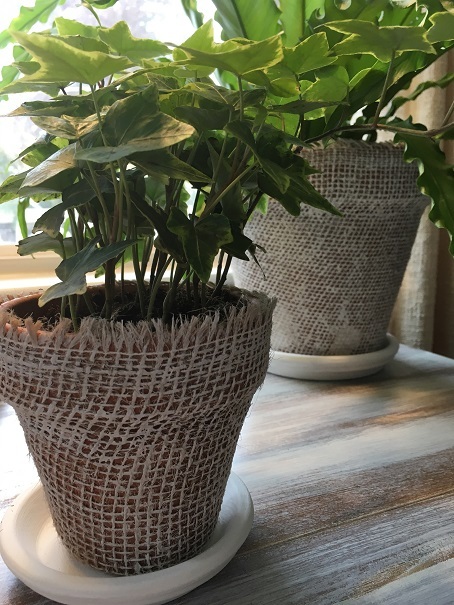 Clay pots are porous which allows airflow to promote good root health, along with an excellent evaporation process, plants benefit from being planted in clay pots. 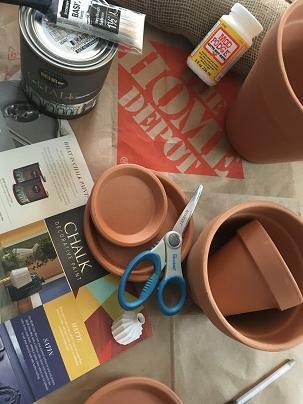 I recently up-cycled a series of terracotta pots, with just a few simple ingredients I added a bit of texture to the new clay pots I picked up at the Home Depot, the pots are finished with a coat of chalk paint by Behr. 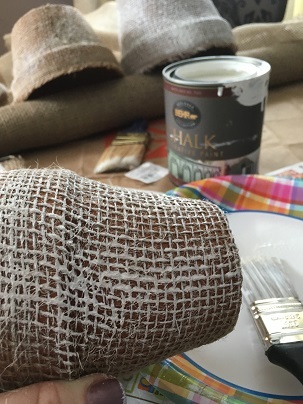 Behr Chalk Decorative Paint can be mixed to any color, the colors on the pallet are beautiful the paint can be mixed to match any existing color you desire. 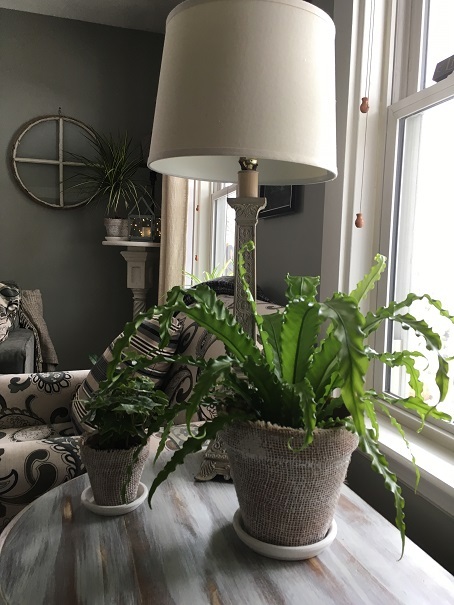 I chose to have the chalk paint mixed to my favorite neutral, Swiss Coffee, a perfect winter white, to match a picture frame grouping I painted last winter. Step 1. 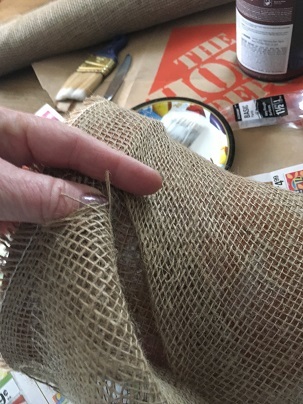 Wrap the burlap around the pot, use the bound edge for the top of pot, allow a 2 inch overlap on the side, and 2 inches at the bottom of the pot, and then cut the burlap. Step 2. Paint a layer of Mod Podge over the entire pot, let it get a bit tacky. Step 3. 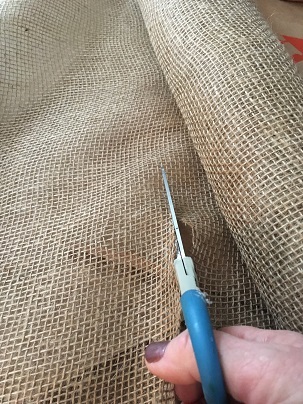 Wrap the burlap around the pot fitting it and sticking the burlap as you go. 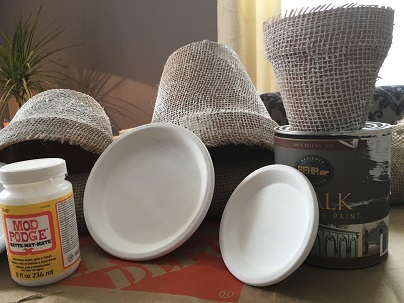 There will be a bit of an overlap because of the classic tapering of the pot, just fold the edge under and trim any excessive burlap, slap some extra mod podge in that area and stick the overlap down and paint on more mod podge to glue it all in place. Step 5. 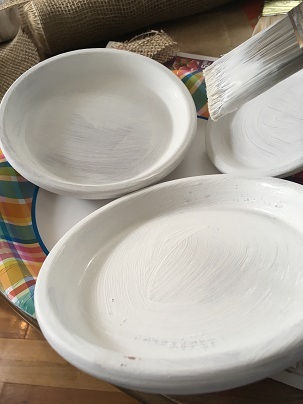 Paint the saucers with the chalk paint, several coats with dry times in between. Step 6. 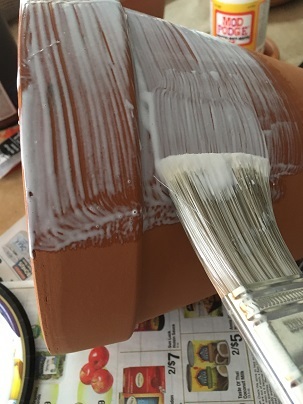 Once the Mod Podge is dry apply a coat of chalk paint onto the planters, us an almost dry brush action for the first coat, you can always go back if you want the color to be less transparent. Step 7. Once again, allow all parts of the project to dry. Step 8. Put your favorite plants into the pots, you can plant directly into the pots or use the painted pots as over pots. 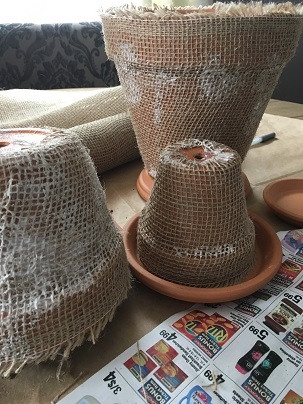 The texture of the burlap along with the application of chalk paint just accentuates the simple silhouette of the terracotta pots; I am so pleased with the results! 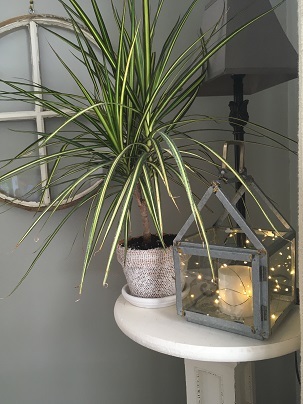 I will give an update on the pots condition in a few months, because the pots are porous the application maybe effected, but for right now a new dose of winter white, a simple but classic terracotta pot up-cycle project was pretty and fun!